Environmental pollution is becoming a serious threat to the human society, and photocatalysis is recognized as an environmental benign technology to remediate organic pollutants from aqueous environment. Mainstream research related to pollutant remediation and energy production is based on heterogeneous photocatalysis, a modified advanced oxidation process. Being a green technology, it can have further applications if the vast and inexpensive solar light can be utilized in place of harmful ultraviolet rays. 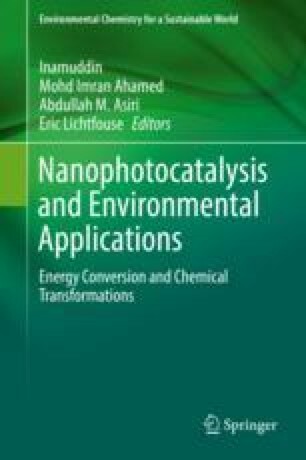 This chapter focuses on some important nano-semiconductor photocatalysts like TiO2, ZnO and graphitic carbon nitride (g-C3N4 or CN) and various strategies adopted for improving their photocatalytic activity under sunlight. Different methods for improving visible light active photocatalysts including metal/non-metal doping, the addition of photosensitive materials, incorporation of other nanoparticles, composite formation with other semiconductors and formation of heterojunctions and nanohybrids are discussed. These fundamental information can serve as knowledge base in constructing next-generation photocatalysts with better properties. Ansari SA, Ansari MO, Cho MH. Sci Rep, 6:27713. https://doi.org/10.1038/srep27713. Hanifehpour Y, Hamnabard N, Khomami B, Joo SW, Min BK, Jung JH (2016) J Rare Earths 34(1):45–54. https://doi.org/10.1016/j.molliq.2016.06.076. Sridharan K, Kuriakose T, Philip R, Park TJ (2014) Appl Surf Sci 308:139–147. https://doi.org/10.1016/j.apsusc.2014.04.121. G. Zhang, S. Zhang, L. Wang, R. Liu, Y. Zeng, X. Xia, Y. Liu, S. Luo, Appl Surf Sci 391 (2017) 228–235, https://doi.org/10.1016/j.apsusc.2016.04.095.